Mary: Born Brosna, Co. Kerry, Ireland, 1867. Married 1893 Augustus James Hamilton Courbarron (d.Bondi 1904). Died Sydney 1927. Kate: Born 1868/69, Ireland, Married ‘Dunne’. John: born 1872, Ireland. Later lived at ‘Tyropean’ Hough Street Paddington; signatory on Edmond’s death certificate. Julia: born 1874/5, Ireland. Married Louis Collings, Sydney, 1896. Ellen (twin of Julia): born 1874/75. Married Edward G. Carpenter, 1907, Waverley. Margaret: born 1879, Ireland. Married 1) Thomas P. Donohoe 1909, Waverley. 2) William J. Donohoe (brother of Thomas), 1924, Waverley. Honora: born 1881, at sea on HMS Peterborough. 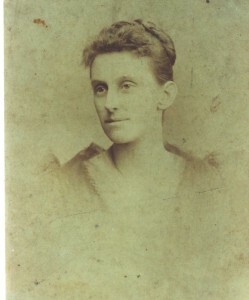 Married Sydney E. Fletcher, Sydney, 1905. Johanna (Hanna): born 1882, Kiama, NSW – Died July 6th, 1942. Married 1) Joseph Phillip Ronan (d.March 1914), Paddington, NSW, 1908. Children: Agnes Irene, John Edward (aka Edward Joseph), Phillip B., Joseph Anthony, Phyllis Catherine, Patrick (born 1915, father unknown). 2) Frederick Scales, Paddington, 1916. Children: Frederick. Honora Lane was born in 1842/3 in Limerick, Ireland to John Lane and Kate Connor/Conor. She married Edmond Morrissey in Limerick and settled in Brosna, Co. Kerry, where she gave birth to 9 children before the family emigrated to Australia in 1881 as part of the Assisted Immigrants Scheme. During the voyage she gave birth to their second last child, Honora. The family eventually settled in Jamberoo, NSW, after their 10th child, Johanna, was born at Kiama in 1882. Honora died at Paddington on the 26th March, 1921, just 8 years before her eldest child Mary. Note: The name Edmond, Edmund and Edward are seen on different records though it appears his name was ‘Edmond’ as this name appears on the ship’s arrivals record log in 1881. There are times however when he is referred to as ‘Edward’ and this is evident in his death notices placed by his wife and daughter. Edmond Morrissey was born 1847/48 in Co. Kerry Ireland, his parents were Michael Morrissey and Mary Lyons. Julia & Ellen (6) twins. The family are listed as Roman Catholics, the children were recorded as school pupils with the exception of the 3 youngest. On arrival the family lived in Sydney at Woolloomooloo however they travelled around because the couple’s last child, Johanna, was born at Kiama in 1882. They eventually settled at Jamberoo, in southern inland NSW, where Edmond’s brother, John, was also living. Edmond died on May 19th, 1907, at his son’s residence ‘Tyropean’, Hough Street, Paddington in Sydney. His son, John, was the informant on his death certificate. Morrissey – In loving memory of my dear husband and our father, Edward (sic) Morrissey, who departed this life at Tyropean, Hough street, Waverley, on May 19, 1907. May his soul rest in peace. Inserted by his sorrowing wife and family. We do not forget you, we loved you too dearly, for your memory to fade from our life like a dream; Our lips need not speak, for our hearts mourn sincerely, Our thoughts often rest where your photo is seen. Immaculate heart of Mary, your prayers for him extol. Sweet sacred heart of Jesus, have mercy on his soul. Morrissey – In loving memory of our dear father, Edward (sic) Morrissey, who departed this life May 19, 1907. RIP. One year, dear father, since we did part, One year brings sadness to my heart; Ofttimes I think and breathe a sigh, To think we never said goodbye. Inserted by his loving daughter, Ellen, and son-in-law Edward Carpenter. Born Mary Hellen, but known as ‘Helen’, she was born in the parish of St Germans, Cornwall, in 1867, the third child and only daughter of Frederick Augustus Courbarron and Mary Hamilton. After the death of both her parents from typhoid in 1876 and 1877, Helen was aged ten when she was placed, along with her three brothers, into the care of her maternal uncle Capt. James Hamilton in Ireland. Helen spent the remainder of her childhood at her mother’s ancestral home of Brownhall in Ballintra, Co Donegal. In 1895 at the age of 27, Helen married Christopher Moody. Helen’s address is given as 88 Duke Street and the couple married at The Church of St Thomas, Liverpool City. Witness: Henry Harris; Rebecca Camp?